In RPT#519 Cunning Cohorts Build Character: Four GM Tips I pondered about what a campaign actually is. I see the term used ubiquitously, and the RPG community seems to know what’s being talking about when someone uses the word. However, as I thought about a definition, I realized there are many variances and parts tricky to define. Take my current Riddleport campaign, for example. It has no plot. The PCs choose what to do. They run an inn, but it has not been central to the action. Several new PCs have joined the group, and several have left. Compare that to a mega-dungeon where there is a linear path with an end goal. Other campaign types and styles seem to fit nicely under the campaign term. So, what makes a campaign a campaign? What is the essence of a campaign? What’s that thing we all understand when we toss the word around across games, blogs, and countries? I asked you, and here’s how you responded. Note, there are no wrong answers here. We play a game of imagination without universal governance, so we each develop our own customs and ideas for things. One GM says a campaign is a string of pearls, the next says it isn’t. The reason why I assembled these sometimes conflicting answers is to give you food for thought. A thoughtful GM is a great GM. My hope is you learn a bit about yourself and your GMing style with this catalogue of campaign definitions and musings. A campaign, IMO, is a story that can’t be told in only one arc. It has ebbs and flows, but is all one tale. Fellowship is a story. Lord of the Rings is a campaign. A campaign is a story. Place, genre, theme, characters, goals, length, beginnings and endings are endlessly variable. But the story – the combination of all these things (and more) tells – is indubitably a tale. Epic, grizzled, comic, or hard-boiled are simply aspects of the greater, fundamental truth: players and GMs combine their efforts to build a consensual universe to frame their story of their characters’ actions. The fundamental part of a story is the evolution of the participants (storyteller + listeners). Stories take listeners to places and times they’ve never been, and then vicariously experience events and emotions. Role-playing games recruit the players to help build this effect and all share (hopefully) in the pleasure of a well-made creation. Which is in itself one of the effects aimed for. * There are seminars and conventions devoted to “Who has the world’s most boring presentation?”… with demonstrations! A series of adventures, holding common setting or characters, which tell a grander, cohesive story. Campaign: A set of adventures interconnected by a narrative. There’s quite a lot of substance in that simple sentence, so let me unpack the relevant terms. A set is a collection of things. In this case, the set is of adventures. It is tempting to replace the word set with sequence or series, but these fail to account for unusual situations where multiple GMs can run adventures at the same time in different areas, as the latter words imply an order that need not exist. An adventure is a self-contained story. It has a defined beginning, middle and end. It can be described independent of other events that take place. An adventure can take any amount of real time to complete, but those that take more than 20-30 hours of game time are probably divisible into multiple adventures. 1) The Destiny Map. The characters find tiles stolen from an ancient temple that lead to an artifact called the Possibility Chalice. 2) The Possibility Chalice. The characters find the Possibility Chalice. This is the hallmark of a campaign. The first adventure may have involved Bob the werewolf, Camilla the Boston dilettante, and Fred the intergalactic swordsman. The last adventure involved six other characters. However, the connection throughout ties them all together. Bob leaves when his inner demons catch up with him, two others join soon afterward, and so on. And it isn’t just the character interconnection that matters. The fact that an event happened in a previous session influences the current session. 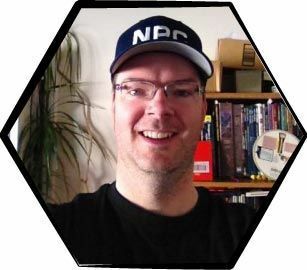 History, relationships and actions from one adventure influence other adventures, and that interconnectivity is vital to a campaign. And the factors that connect the adventures — history, relationships, events and actions — are summarized by the term narrative. I look at story building and campaign building in the span of story arcs. Like the pilot for a TV series versus a movie or movie series. For one-off style stories, I focus on the action, the primary plot, and just enough side-story info to give the world some richness. But it doesn’t consume much of my time as a GM. When building a game I expect will extend into a campaign, I look to the greater plot structure that cannot just unfold in front of the players, but should also provide the world a greater depth. This allows players to explore the themes and sub-plots not resolved during the shorter segments. Character development and relationships have much more prominence as they weave through the primary plot and the meta-plots. I tend to work in the 3 or 5 act structure when building my stories. This gives me opportunity to have guidance in setup, conflict or rising action, and then resolution. Using this same structure, I can then sprinkle setup for other later stories, or ramp up the conflict off-camera with hints and sideline stories. Do I always know that a game I start will become a campaign? No. Some of my best campaigns started with a one-nighter plot of “Go rescue the Princess.” Next thing we know, it’s 2 years of real time later of regular sessions, and the party is vying for dominance with a rival group of adventurers to the county elders after having adventured all over Northern Europe. I think your tip in issue #519 helps seal the deal between a simple story, and a campaign: relationships. The party develops relationships amongst themselves in-character, and with recurring NPCs. The shift from story to campaign happens when those relationships begin to evolve and make a difference to those around them. I see this played out in the classic debate between two TV series: Babylon 5 and Star Trek:TNG. To me, B5 was a very large campaign. STTNG, not so much. In B5 we see the characters evolve and change because of, and in spite of, their relationships. ST had to have everything back to status quo at the end of each episode, with only slight evolution in our characters. Both were great shows, but to me this is a clear example of a series of stories versus a campaign. I Googled the definition of the word campaign. The definition given, that would pertain to an RPG campaign, was “an action that has a goal” (my interpretation). Is a campaign that lasts for 20 years of game time a campaign? Not to me, unless your party’s goal is to rule the universe. I would opine that a campaign is as simple as saving the farmer’s son or daughter from the marauders. A goal was set and, hopefully, accomplished. Random encounters are not mini-campaigns, but are skirmishes – part of the campaign. If the original party is wiped out, their campaign is over and the next attempt is a new campaign. If some of the party survives, and they need to go back to town for new party members, that would be part of the same campaign. It would continue to be the same campaign even if all the original members were eventually replaced, because there would be a party continuum passed along from the original party members, as opposed to starting over with a totally new party. The new party may or may not have heard of the attempt to rescue the farmer’s child, but it is now their campaign to attempt the rescue. I would argue that if a DM is running the same campaign with all new players, it is no different than the same players starting out with all new characters. The campaign becomes new to them because of the lack of party continuum. I think there needs to be at least one old character from the original campaign for the campaign to be called original, even if it is a NPC who comes looking for new adventurers. I would also argue that simply using the same setting for adventuring isn’t an on-going campaign, unless there is a goal that has never been accomplished in all that time. That goal, to me, would qualify as a campaign. However, just running around the city doing the things adventurers do would not be a campaign. Even if a character in a party has an individual goal (becoming a lich, king, grand pooba), I wouldn’t call their quest to accomplish that goal a real RPG campaign. That is, unless the character is doing one-on-one. ( Any henchpersons, familiars or servants could be part of the one-on-one campaign as long as they didn’t have an agenda at cross purposes to the PC. These NPCs are just part of the flavor text). A single PC could be the focus of a campaign with the other party members as support of that campaign (paladin on a holy quest, apprentice looking for rare spell components, tax collector traveling from village to village until all the taxes are collected). The campaign could continue if the PC dies and someone in the party takes up the cause, even if it is an NPC who comes in to take up the quest to accomplish the original goal. And, the campaign wouldn’t necessarily be over unless the other party members all decide to head back to town to see what else they could do. Say a party ends up in a situation where it’s obvious they are in over their heads. I would say that going out to level-up would also be part of the original campaign, because they are working to accomplish the original goal, even if it takes a couple of years of game time. Say a 1st level party decides to save the princes from a 10th level red dragon. While a bad idea at this moment, it would be a viable idea when the PCs hit 10th level. However, this doesn’t constitute an on-going campaign because it is just part of party development, starting with low level campaigns trying to work up to a higher level campaign. I hope this all makes sense – fun idea – thanks for the opportunity to stretch the little grey cells a little. I would say that the Iliad was a campaign but the Odyssey was, well, an odyssey, but not a campaign to get home. A campaign is a series of adventures linked by the setting in which they happen. When I say a series of adventures, I say it that way because it could be a lot of different scenarios. In a Stargate campaign I ran, each game session was a self-contained adventure that had mostly nothing to do with the other sessions except they were played with the same characters in the same setting. Using the awesome power of the Stargate universe, some of those sessions weren’t even with the same characters. In one session I wrote up, the PCs’ personalities got transplanted into robot bodies, and in another they were sucked into a virtual reality world where everything was like a D&D world. So, exactly who the characters are doesn’t really make the definition of a campaign. Neither do the players. But the fact that the adventures are a series, that is, there are more than one of them, and they all happen in the same setting (although that one setting could include innumerable different sub-settings, ala Rifts, Sliders or Stargate) is what makes it a campaign. Have a great day, Johnn. A campaign is an extended story, often episodic in nature, stretched over at least two sessions or episodes, with some continuity in heroes, villains or setting. A campaign is a series of adventures (ranging from 1 to infinity, as longer solo-adventures are also campaigns in my opinion) which have a certain binding aspect about them. As such, a campaign is a story or series of stories held together by a common feature. It stops being a campaign when those involved no longer believe the stories have any relevance to each other. Any series of adventures that are linked in the game. As long as each adventure can be linked back to the previous one all the way to the beginning, then that creates a campaign, regardless of what the location or which PCs are involved. The group I DM’d for twenty years ago can be directly linked to a bunch of one-offs I’ve done over the years, which directly connect to the current group I’m DMing. I believe that’s one long campaign. I always have viewed a campaign as a book that can stand alone, and each adventure is a chapter. The campaign can take characters anywhere, and the campaign has some type of conclusion like a book does, as well. But like some book series, a campaign might continue on beyond the first book. A campaign might end if it feels right without having certain questions answered, like having a group of characters divided without having the main problem solved. As an analogy to Lord of the Rings, the Fellowship of the Ring ends without the One Ring being destroyed in Mount Doom, but there is a parting of ways, so there is a feeling of conclusion. As long as the game master puts a cap on the end of the campaign that gives some sense of completion, I believe the game master should feel free to stop that current campaign and start up a new one, even if it’s a continuation from the last (from Fellowship of the Rings to the Two Towers as the analogy). More often than not, game masters can use the passage of time as a normal stopping point between one campaign and the next. This time-lapse is illustrated very well in the Chronicles of Narnia series between The Lion, Witch and the Wardrobe and Prince Caspian, which is a 700+ year lapse of time even though the main characters have only aged a few years. What makes a campaign is narrative continuity: the pretence that the fictional universe of the game has continued existence before and after a stated story goal (adventure). Any time a new game adventure starts with the understanding that the events of a previous adventure were part of one shared reality – the tangible facts of a single natural history – they become part of a single campaign. Likewise, when source material is written to provide a backdrop that will persist between game sessions, it becomes a campaign setting. It’s the same tie that binds the Marvel Universe, the Buffyverse, the “Law and Order” conglomerate, and countless other works of fiction into coherent, brandable units. To me, a campaign is a storyline that involves at least the same NPCs, geography and plots. I have run campaigns where we started a bunch of characters at 1st level and ran until we were sick of it. I have run campaigns where every character died or retired or changed. I have run campaigns where players came, went, and switched. But what they all had in common was the set of major and sometimes even minor NPCs. In every campaign I’ve run, the NPCs were at least consistent. The changing PCs could still encounter the same kings, dukes and tavern wenches that were introduced earlier in the campaign. The campaigns were often somewhat geographically linked. In fact, early in my campaign designing, this was the only link since there was no over-arching plot. For my style of play as a mature GM and player, the campaign has to be defined as a plot. The campaign is like a TV show. You can either have a serial show like MASH, where the characters continually change but the geography stays the same. You can have a story-arch campaign like Buffy the Vampire Slayer where the enemies change up, but there is a continual story line for the main characters. You can have a serial campaign like Stargate, where even the geographies change but the premise and most of the main characters stay consistent. All of these TV shows have something that stays consistent and defines them. Even LOST, with its freaky changes, is a whole story. I think campaigns have to be whole stories in some shape, form or fashion. When the story element is removed, the interest is too and it’s no longer a campaign or a role-playing game but a tabletop strategy game. A campaign is a story. A story that is told through the actions of the players, the NPCs, the monsters, and the worlds in which it all takes place. A campaign is a linked group of adventures that tell a story and define major or minor events occurring in a specific setting. The adventures are created by the GM, or at the least, linked by the GM. The characters are run by players and may or may not stay constant. The setting may be home brew or commercial, but the events described within the campaign directly impact the history, environment, or culture of the campaign setting in either a major or minor way. I’m not sure this covers every campaign I’ve ever heard of, but it covers a good 90% of them. I’m old school and simplistic: until I read your request for a description of a campaign, I would have said it was a linked group adventures involving a central group of characters that directly impacts the history, culture, or environment of a campaign setting. I went back and revised. The central thing I think though is the story that the campaign tells. I have always defined campaign as a series of encounters and adventures that takes a party to a defined goal. A campaign is a set of two or more adventures connected to each other by one or more forms of continuity. This continuity may be the characters, game setting, rules interpretations or campaign background. The connection must be such that the outcome of one adventure has some sort of impact on the next, whether that takes the form of characters earning experience, NPCs in the second adventure reacting to events in the first, or an overall plot thread connecting the two adventures together. In the military sciences, a military campaign is a term applied to large scale, long duration, significant military strategy plan incorporating a series of inter-related military operations or battles forming a distinct part of a larger conflict often called a war. The term derives from the plain of Campania when it was a place of annual wartime operations by the armies of the Roman Republic. A role play campaign denotes the time during which a given player force conducts game operations in a given genre (often referred to as milieu). 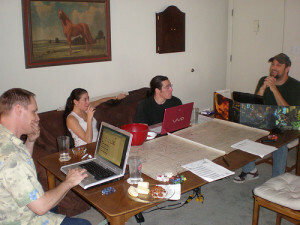 An RPG campaign may be executed by either a single party of adventurers, or as a combined campaign conducted by multiple groups of players and game masters (GMs). An RPG campaign is conducted with the purpose of achieving a particular desired resolution of a story line as its strategic goal, usually within a clearly defined resource, geographic and time limited criteria. Although the duration of a campaign may be as short as a few weeks, due to the nature of campaign goals, they usually last several months, or even years as defined by David M. Malinski. A campaign is a phase of an imaginary character interaction and plot development involving a series of role play sessions related in time and space and aimed towards a single, specific, strategic objective or result as defined by the GM, players or both. A campaign may include a single plot, but more often it comprises a number of plots over a protracted period of time or a considerable distance, but within a single genre of operations or delimited milieu. A campaign may last only a few weeks, but usually lasts several months or even years. The success of an RPG campaign is evaluated based on the degree of achievement of planned goals and objectives through in-person role play and online or non face-to-face RPG operations. This is determined when one of the primary plot lines comes to a conclusion within the constraints of the planned resource, time and event allocations. The manner in which an adventuring party terminates its operations often influences the wider perception of the campaign’s success. A campaign may end in TPK, and be followed by the transition of players and GM’s authority to a new authority and the redeployment of players as a new GM or GMs, or a permanent installation of a new set of adventuring parties as the group is disbanded. A campaign is at best a loosely defined term. It changes from place to place, group to group. In Melbourne, three sessions by the one author can be a campaign, even if each is a standalone session with new PCs in a new setting. In Brisbane you need to get past the six session hurdle to be a proper campaign. I have heard some Americans say you need to have multiple modules to make it a campaign, regardless of how many sessions it takes to get through a given module. So unfortunately, I don’t think there is an answer to your question. It is too much a matter of personal usage. My personal definition (which is no better than any other) would be that a campaign is any series of linked sessions. The links could be almost anything: story, ongoing PCs, setting, themes, goals, even villains. I say sessions, not adventures or modules or plots, because an RPG session has nice, easily defined boundaries; at the end of the night people go home. I say series, meaning more than one, to differentiate it from one-off games (which are a very different mindset). Oddly, some of my campaigns have not made it to the second session, so I seem to unconsciously count planned sessions as well. There is also a big difference between an ongoing game (no fixed endpoint) and a mini-series (a short campaign with a definite story arc leading to a fixed endpoint). Had to respond to this immediately as I was just (literally, five minutes ago) talking about this with the Finance Director here at work (I work for a charity). For instance, he looked up the definition and found this: “a connected series of operations designed to bring about a particular result <election campaign>”. In fundraising, this means the overall objective of our fundraising efforts. We have two types of campaigns: capital and annual. Capital campaigns are for large, expensive goals that might extend over years, such a building a new wing on a school or hospital. Once the wing is paid for, the campaign ends. However, that campaign includes numerous different fundraising efforts called appeals (an appeal can be a bake sale, a walk, or a charity ball; also, the direct mail pieces you find in your box are called…well, direct mail appeals). An annual campaign ends at the close of the fiscal year, and encompasses all the appeals that were made to pull in funding for the fiscal year. Those funds may be pre-designated to go to a variety of areas, such as specific programs, or they may be unrestricted, meaning the charity applies the funds to where they are most needed. I think many, if not most, roleplaying campaigns (especially ones out of the box) are Capital Campaigns. The GM has a specific objective for the characters to meet in the end; once the characters reach that objective, the campaign is over. And, like charity capital campaigns, the goal of the campaign is usually something pretty big (killing a god, becoming a god, saving the universe from a god). The various missions along the way are the appeals – the different methods of gradually reaching and accomplishing the final goal. Currently, I’m not running a Capital Campaign. I’m running an Annual Campaign (in Pathfinder). All the characters had to start off as level 3 rogues, but were given permission to go in whatever direction they wanted. I started them off with a simple heist, and in addition to providing them with my pre-fashioned heists, I’m giving them fairly free reign to come up with their own (and they are far too clever for their own good, sometimes). I don’t have a set goal for the campaign, other than to see them get to 20th level, hopefully (“the end of the fiscal year”). The missions (“appeals”) they do aren’t designed to lead them to one specific goal, but to provide them with wealth and experience to spend as they wish (“unrestricted gifts”). To be honest, they’re loving it. They don’t feel railroaded, though they have received reminders that their actions can have undesirable consequences, especially given which side of the law they’re on. Sometimes I have to do a little thinking on my feet (my one female player heavily researched cons for this campaign and loves to spring them on me mid-session), but for the heists they tend to give me at least a session’s warning so I can be a little prepared. We’re all having a blast. In any case, that is one look at what is a campaign. Another would be a complete TV series, such Buffy the Vampire Slayer or Smallville. Complete story from beginning to end (as in, not cancelled part way through), which follows a group of people (though in these cases, you have a central character surrounded by a tight, but still secondary cast of supporting characters) through their journey to self-realisation. Buffy defeats the The First Evil and shares her abilities with the Slayerettes. In passing out her abilities, she becomes self-realised in that she no longer has to be the one, but becomes one of the many. Clark (I’m presuming, because I’ve only seen up to Season 8) stops running around in a trenchcoat as The Blur, puts on his red and blues, and presumably starts flying, thereby gaining self-realisation as Superman. In these cases, the campaign finishes, because the story that was meant to be told (which of course, consists of numerous smaller stories) is complete. And each smaller story (episodes and seasons) is in the end, all part of the mosaic that makes up the campaign, even if they can act as stand-alone stories of their own. A campaign is a game where even though the PCs and locations change, the gaming system used remains fundamentally the same. If you change from playing Shadowrun to playing Savage Worlds, you’re no longer playing the same campaign. On the other hand, if you change editions or agree on new house rules for the Shadowrun, it’s still the same campaign. A campaign is any long term effort to accomplish something significant. Something akin to the liberation of a kingdom. It sounds pretty simple, well it is, and it isn’t. It’s just a matter of asking who’s defining it. In our case, the onus falls on the GM. It can be as simple as a taking out the tyrant, or as complex as assassinating said tyrant, rooting out its supporters, establishing a hideout, finding informants, counter espionage… . That can take a lot of time. You can take your time roleplaying the nitty gritty, or make it episodic with occasional side quests, but the long term goal should be the same. Either way, what matters is everybody agrees on the goal, and has fun achieving it. So here is my cut-to-the-bone definition of campaign. After reading all the correspondence, I see a couple of common themes I think form the essence of campaigns. Note this is my personal definition (and always subject to feedback or critique) and is in no way THE definition. You form your own, and stick with what works best for you and your players. Interactive continuity resisted by an opposing force. Interactive: Players and GM are needed. If you have no players, you’re just writing a script or book. Continuity: Some element must tie gameplay together over time. Generally: players, characters, setting, goal, GM, game system. Not all are required. Resisted, opposing: Campaigns requires conflict. Multiple conflicts are possible: player goals, GM goals, character goals, character growth (or lack of), external reward, milieu situation. Force: Every campaign needs a villain. A villain can take several forms: god, NPC, technology, natural disaster, deteriorating condition such as disease, aliens or race, and more. So, for my definition to work, I need a game with GM and players, at least one common element that exists between game sessions, one or more goals, and a force that stands in the way of achieving the goal. How about you? What do you and your players need for a game to be called a campaign? Better yet, what does your group need for a campaign to be considered great? That sounds like an excellent conversation to have right now, whether you are mid-campaign or between.